One of Aesop’s fables is that of the young crab and his mother. Mother crab tried in vain to walk straight forward, but she could walk only sideways, like her son. When she wanted to turn her toes out she tripped and fell on her nose. The moral of the fable? Don’t tell others how to act unless you can set a good example. And local government could learn something from it. City government tells us that preserving historic architecture is a matter of serious public importance. In certain core neighborhoods, it regulates even basic maintenance to ensure that historic structures are not unduly altered. It must approve demolitions, to ensure that historic buildings are not razed without good cause. Nevertheless, our government has exempted itself from many of the standards it imposes on the rest of us rubes. The law is littered with exceptions for government entities. This is especially evident with respect to the handling of the Carrollton Courthouse located at 701 South Carrollton, which is owned by the Orleans Parish School Board (OPSB). The courthouse, designed by noted architect Henry Howard, was built in 1855 on the site where Andrew Jackson himself delivered a speech commemorating the 25th anniversary of the Battle of Orleans 15 years prior. After the area was annexed by the City of New Orleans, title was eventually passed to the city and then to the McDonogh Trust, which developed public schools in the city. The building was used off-and-on for schools until 2013, and has since been vacant. Now, the OPSB is considering auctioning off the property to the highest bidder. So why the concern over the Carrollton Courthouse? Isn’t it protected from demolition by the same laws that make the rest of us serfs grovel before a committee? You can guess which block that is. It’s all hugely perverse. 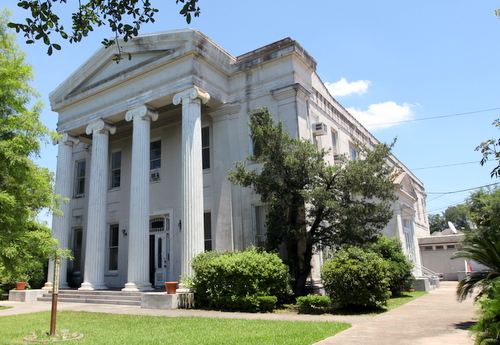 If you had to pick one building out of the entire Carrollton neighborhood to preserve, you’d be hard-pressed to find a structure more worthy than the Carrollton Courthouse. It is the last remaining public building from the government complex built there in the mid-19th century, and is an iconic antebellum structure designed by one of New Orleans’ most noteworthy architects. Frankly, the hypocrisy is what sticks in my craw the most. I’m sick and tired of preservation being a sticking point for the little guy, while government exempts itself and wealthy interests buy their way through the process. The result is that those structures most worthy of preservation are also those that are generally at greatest risk. This is why I often rant against the Historic District Landmarks Commission, which regulates preservation in local historic districts. They’re telling me to walk a straight line, when government is walking sideways. It would behoove the OPSB to publicly declare that it will not allow the Carrollton Courthouse to be demolished, and to require covenants in any future sale that would ensure its preservation, even if those reduced the sales price. It would behoove the city to change our preservation laws to ensure that apply equally to all government buildings. That, dear readers, would set a good example. 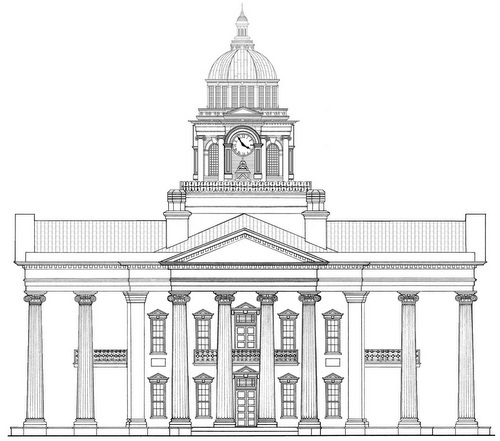 A drawing of the Carrollton courthouse. It is a beautiful building and worth saving. What makes it even worse is the fact that all of these Non-profit and governemnt buildings are also tax exempt from paying property taxes. So not only do they let the building rot…It also costs them nothing to let them get a demolition by neglect. In fact…It makes financial sense for them to let the building decay to the point of no return. I agree the – the building should be saved. Your article is is a little confusing. HDLC a parent and the OPSB is the other parent – a e-strange-d marriage???!! However, neither of them has asked nor permitted the demolition. In my opinion the residents / citizens of Carrollton are the forgotten parents who have taken the leadership to advocate, help and apply for the designation to preserve and protect the building. HDLC nor OPSB have the authority to do so. At this point Carrollton area leaders including Drew Ward are waiting to hear from the authorities having jurisdiction to act on the application. So your article is a day late and dollar short. I’m talking about buildings owned by government entitles generally. Why government bodies have any exemptions from preservation laws is beyond me, particularly when the same government that imposes the HDLC also maintains those same exemptions. That’s a broader issue than simply whether nearby residents should or shouldn’t be spending their precious time on advocacy. And even if that weren’t the case, surely the retention of the courthouse is a matter of interest for the whole city, not just those who live nearby. I don’t know much about the drawing of the local historic preservation stature decades ago, but I suspect there are all sorts of conflicting constitutional and statutory provisions. I seem to remember disputes between the VCC and the state over the iron fence at the Cabildo. I’m not sure how that worked out. I couldn’t agree with you more Owen. It’s pathetic that New Orleans haphazardly seems to be destroying all that has made it a uniquely different city. So sad!! I’m not sure it is the city government that exempted school board property from the purview of city preservation laws. Preservation law is a hodgepodge of partial controls. Life can be unfair to historic structures. I think if you asked the Mayor or City Council they would echo your desire to preserve the Courthouse. I do believe the owner of historic property does have an obligation to only sell to sympathetic buyers, but I am not sure how they would work for a school board with excess property. I hope a white knight appears to protect this building. There is a reason God made rich people. Sure, preservation laws are a hodgepodge, but this was a concerted effort to exempt government-owned property. We were simultaneously passing laws that imposed burdens on ordinary citizens while exempting government from those same rules — even though entities like the OPSB own some of the most historic structures in the city. Clearly, the laws reflect a hypocritical mindset and do need to change, and they should change before we start putting additional burdens on ordinary citizens. The council is all agog over the idea of expanding HDLC jurisdiction — how about they work on taking away the OPSB’s exemptions first? That said, you’re right that as a practical matter the only solution is for the OPSB to take preservation of the building seriously (as I suggested) and/or for a wealthy buyer to come along who wants to see the building retained. But in the future, I don’t want this to come down to the good graces of others. This “preservation for thee but not for me” shtick is really getting tiresome. Well, if other political entities are not willing to change the laws affecting their properties, should we abandon the preservation laws we have? PLEASE tell me it’s not being threatened!!! It has no legal protections. The OPSB could tear it down tomorrow if it wanted. Amen Owen! Let’s see them walk the walk. Owen – The title of your editorial is amiss. It should not read “The hypocrisy of historic preservation” but “The hypocrisy of government.” Anyone who has a clue understands that one branch of government may have one hell of a time coordinating with another. Demolishing a Henry Howard building, in and of itself, would be a criminal act! It would be comparable to razing Esplanade Ave, which boasts a number of Henry Howard residences. it’s not the humidity… it’s the stupidity !!!! Did the cupola shown in the drawing ever exist? Government exempts itself because it can’t afford the burden of the costs of the regulations it creates for private citizens. The only solution is to allow deficit spending at the local level as is the case with the Federal government. Then our city government could solve all of our problems if it didn’t have to worry about fiscal concerns. We could be much more like Detroit. As I understand it, according to law, any public agency, local, state, or federal, can purchase the property from the OPSB for the appraised value of $ 3.1 million (or perhaps even swap other real property of equal value). If no governmental agency wants it, it will go to auction, and the price will almost certainly be bid up. What the public can do is to urge government officials on every level, from the U.S. Senate to the City Council, to find a public use for this Carrollton landmark. I’m curious- if someone buys it from the OPSB, won’t it then fall under protection? Because it won’t be an OPSB-owned building anymore, it will then be a whoever-the-heck-bought-it-owned building, right? So someone couldn’t buy it and then tear it down- they’d have to follow the preservation laws because they aren’t exempt. In terms of this specific building- it wasn’t actually built as a school originally and could be used for other purposes. Selling it and putting it into the protected category (which should automatically happen as soon as the sale is concluded) is really the best option. I think you are correct that if the building falls to private ownership, it will be instantly nominated as a landmark and be subject to regulation. I think the danger to the building is that there will be no takers. The school board is wise to try to sell, as the responsibilities of ownership of such a building are beyond its mission. My understanding, which could be mistaken, is that the building isn’t protected even if it is sold. I believe it was simply omitted from preservation laws entirely (hence the attempt to raze it and put an A&P there back in the 50s). Any building can be nominated as a landmark, absent some exemption as for the school board, and I think some interim protection instantly applies while the nomination is considered. My understanding is also that you can’t designate a landmark without the assent of the owners. In America, we have multiple governments at every level. I don’t think “government” exempted itself from historic preservation law. I think some governments were excluded from regulation to the dismay of other governments. I’m not about to permit our elected leaders to skirt responsibility by creating multiple entities; we elect a limited number of politicians who can pass laws regarding historic preservation, and ultimately the buck stops with them. That’s the “government” that responsible. Your permission is not required for past events, and there is no proposal to create new multiple entities. I can certainly not permit them to disclaim responsibility by announcing that I do indeed consider them responsible. Lawmakers are the ones who make these laws and they need to reform them. If they’re not willing to change, the issue should be forced. You don’t need the OSPB’s assent to strip them of their exemptions. Are you sure? Is that something the City Council can do? If not the council, then certainly the state legislature, which is highly deferential to representatives in local matters. I’d check the Constitution too. Exactly. It’s an unfair, contradictory mess that ought to be fixed. Instead, we’re looking at imposing additional obligations on ordinary citizens. Actually, I think we are looking at imposing the ordinary historic preservation obligations on additional citizens. Those already burdened don’t get a double dose. I feel certain that we could never have historic preservation rules for all properties. There’s nothing “ordinary” about the local historic district rules, and they were never intended to be imposed citywide. Well, ordinary is in the eye of the beholder, and while there is no city wide historic districting, the entire inventory of buildings is open to landmarking, although certain owners are excepted. Yes, Deux. The cupola and other components such as the side porticos and galleries were original to the building. Most items were removed by federal troops and taken for scrap metal salvage during reconstruction. The drawing in the article shows the way the building looked from the front & rear. The one below is how it looked from either side. Thanks. I knew those Yankees were barbarians. PLEASE developers restore the building to its original appearance!!! This would be a wonderful looking addition to the city! The building might not be historically protected, but the OPSB could add a covenant to the title requiring the facade maintain a certain appearance or the building reverts to someone else’s control, say the Preservation Resource Center. Will the freedom from being subject to preservation be transferred with the property when OPSB sells? The new owner would not be an entity of the OPSB and would therefore be subject to preservation, no? Is there hope that this is true? The courthouse is not in a city regulated historic district, and at the moment of transfer to a private owner would not be subject to city regulation. Individual buildings outside of historic districts can be designated as landmarks and be made subject to city regulation. As suggested elsewhere, a new owner will surely expect to have the courthouse so designated. Could it be that once the property is transferred to a new, non-OPSB entity that the exemption from preservation no longer applies? Another example of the city’s hypocrisy about historic preservation is the ugly high-voltage power lines strewn along the French Quarter and Warehouse District. The city exempts its ugly antiquated infrastructure. I was wondering the same thing? How about the side galleries? was that what it looked like at one time? how wonderful it would be if it were returned to that! I agree with Owen’s suggestion of the OPSB imposing a restrictive covenant preventing the demolition of the historic structure upon a sale. Such an action would throw a bone to the community (the board could use some positive exposure) and it should not impair the OPSB’s economic return in a fair and transparent process. A Historic restoration of the building, if done properly, would generate significant equity from the 25% State Historic Tax Credit and 20% Federal Historic Tax Credit. Add to that a 5 year Restoration Tax Abatement, a historic developer (and there are plenty of them out there) could afford to pay a premium for the site. With demolition and new build, you receive none of these incentives and have diminished our cultural heritage a little bit further. “The courthouse, designed by noted architect Henry Howard, was built in 1855 on the site where Andrew Jackson himself delivered a speech commemorating the 25th anniversary of the Battle of Orleans 15 years prior”. 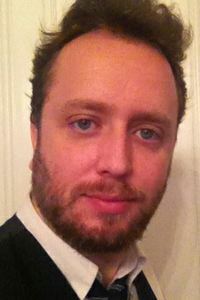 Mr. Courreges could you cite your source for the above quote taken from your article.